Deep purple in color with aromas of leather, licorice, berry, and cassis. Earthy flavors with dark berries and a hint of licorice and pepper. Pairs well with pasta bolognese and beef. Recommendations: French wine is one area where I have a serious weakness in making selections. It’s not that I haven’t enjoyed French wine when drinking it, but only that it wasn’t a region I indulged in when I first got into wine, and as I’ve gotten older and expanded my wine horizons, it’s still been missed in favor of other regions. I’ve decided it’s time to rectify this situation. During a trip to my local Richmond wine shop for a tasting, I confronted the owner about my problem and asked him to help me. He helped me pick out a couple of bottles, one of which, the 2005 Maison du Midi, was actually on the employee recommended list. Two people recommending a wine to me is usually enough to make me buy it. My wife and I paired the Maison du Midi with a simple dinner of pasta bolognese, and we both said the same thing about it. Earthy. Aromas of licorice, creme de cassis, and leather blended well with earthy flavors of dark fruit and a hint of cassis and pepper. I very much enjoyed the wine partly because it paired quite well with the meal, and also because I’m a fan of earthy wines. This is the second Rhone I’ve had in recent months, and it’s quickly becoming a region I’m intrigued by. While I’m still learning about French wine, I suspect it’s going to be an education that I enjoy. 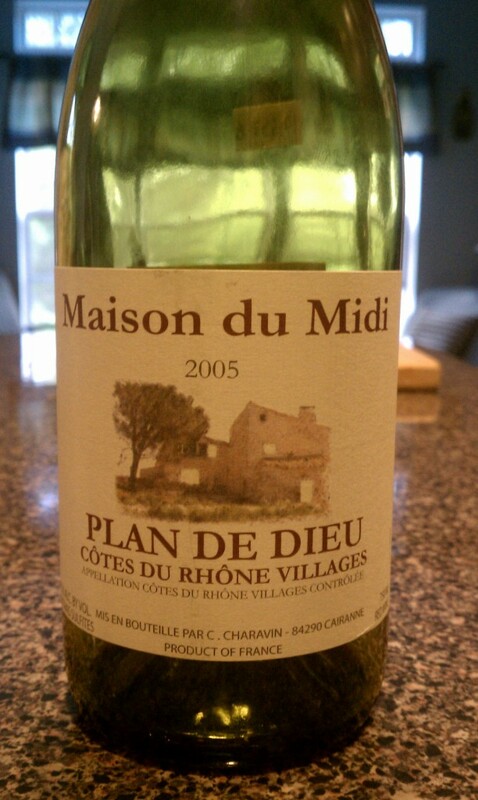 I very much enjoyed the 2005 Maison du Midi and will have to keep it in mind for future purchases.